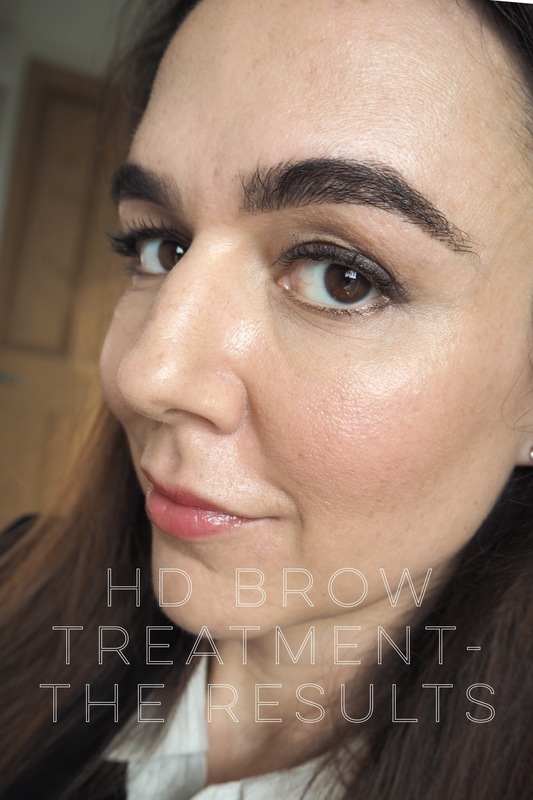 My Review of the High Definition (formerly known as HD ) Brow treatment at Salon Nia in Cardiff, with before and after photos. High Definition Brows is a brow treatment available in certain accredited salons, check the HD Salon finder to find your local HD trained Brow expert. I was lucky enough to be given the opportunity to have my brows done by Master Brow Stylist Celyn Hamlin at Salon Nia. I was somewhat anxious and sceptical about HD Brows. I have pretty full brows that have been growing back since February (check out my Brow regrowth post) and I didn’t want my brows made smaller. So I wasn’t sure what Celyn was going to be able to do with them. My husband would have killed me if I’d come home with skinny brows. 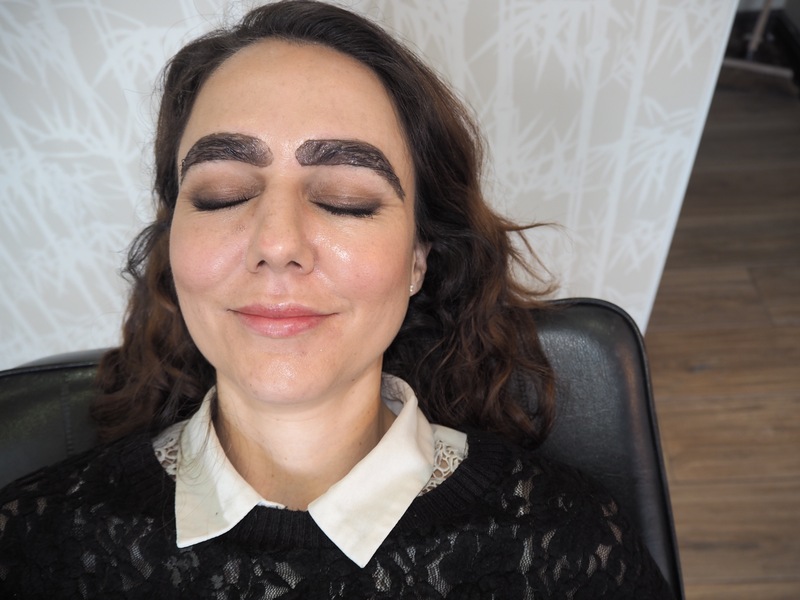 I went to Salon Nia with a friend who goes regularly for her HD brows. She is on a “Regrowth Program” for her skinny post 90s brows. I’ll explain that later. So I was initially unsure about what High Definition brows were all about. Would I leave with thin eyebrows or crazy black slug brows, I was pretty uneducated. I needn’t have worried though. 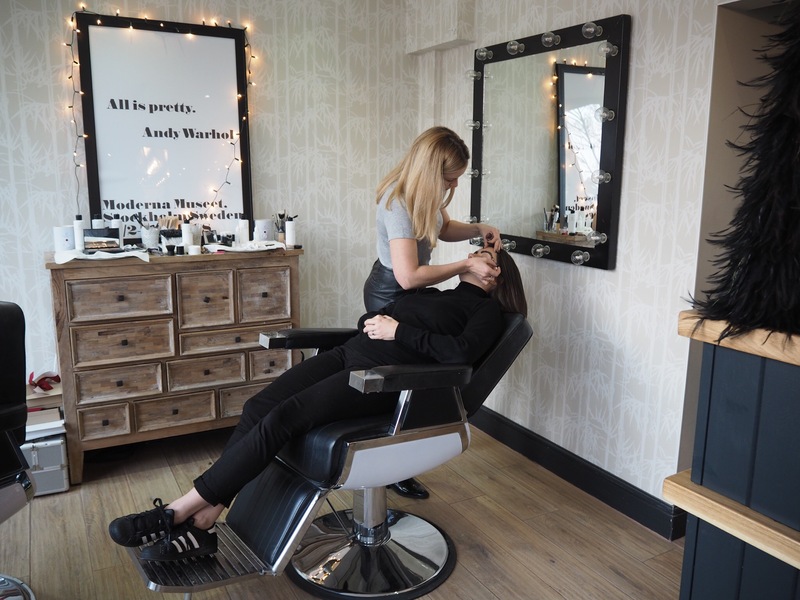 Consultation– Celyn, the stylist, was told in no uncertain terms that my husband would be upset if I came home with thin brows. I filled her in on my brow history and Celyn reassured me that she knows what she’s up to. I could tell by her brows- natural looking but very neat, that I was in good hands. Your brow stylist should make an assessment of your face shape and style to tailor your brows to you. Celyn chose a shade that matched the roots of my hair so that it looked natural. I think the tinting made a huge difference to the appearance of my brows. It made all the fine brow hairs visible for a fuller appearance. Waxing– The HD brow stylist embarked on a precise and detailed brow topiary session. I laid back and relaxed. She applied hot wax to the area above and below the brows and removed brow hairs to create a more defined shape. It was a little painful for a couple of seconds, but no big deal. Threading– This is an Eastern method of removing fine hairs from around the brows using only a cotton thread. (You might have seen it done in shopping centres). It cleans up the whole brow area to create a neat polished look. It was only slightly painful. Tweezing– Any stray brow hairs that were still lurking after the waxing and threading were tweezed. Trimming– Celyn did some very subtle trimming to bring any sprouty hairs under control. As she was working she kept stepping back to check symmetry, she was totally measured and took her time to make sure everything was just so. Makeup and Aftercare– The stylist used this way cool Brow pencil to create individual brow hairs to fill in any sparse areas. The nib is firm and you use a scalpel to sharpen it into a flat blade in order to create hairs breadth strokes. 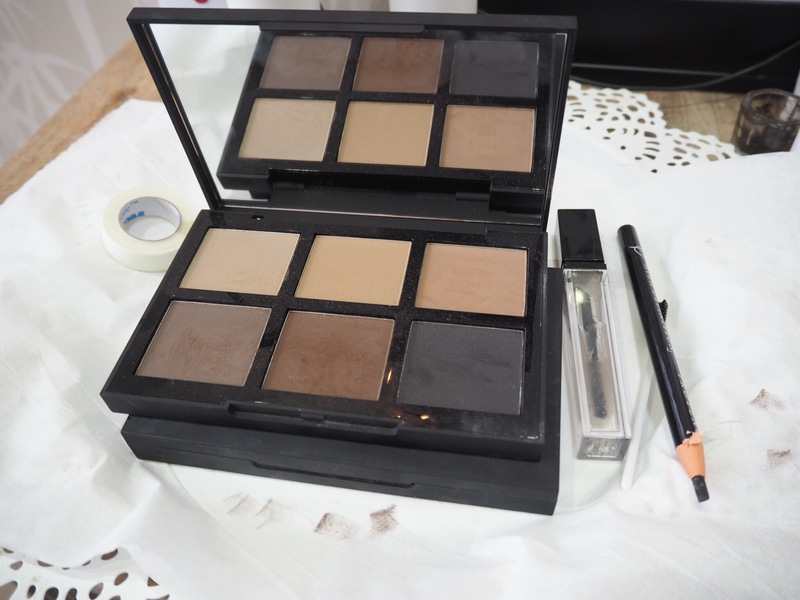 High Definition Beauty does some excellent brow products- Brow palettes, Brow mascara and pencils. You can see from the before and after how much neater and defined my brows are. My long random curly ones have been trimmed, the spaces filled in with makeup. It looks so much better than before. I feel like I just need a smidge of makeup on them now, rather than the whole lengthy filling in process. My unmade up brows look a lot more presentable. I love it. Celyn advised I could return whenever I felt my brows need a tidy up. Some clients come in every couple of months, son just pop in annually. I think I’m going to make it a regular thing, the HD Brow treatment has made such a difference to my appearance. Like I said, the friend who joined me for HD Brows is less well endowed in the eyebrows department. After the whole HD process her brows are coifed into a shape that she can follow when she’s applying Brow makeup and the strays are gone. 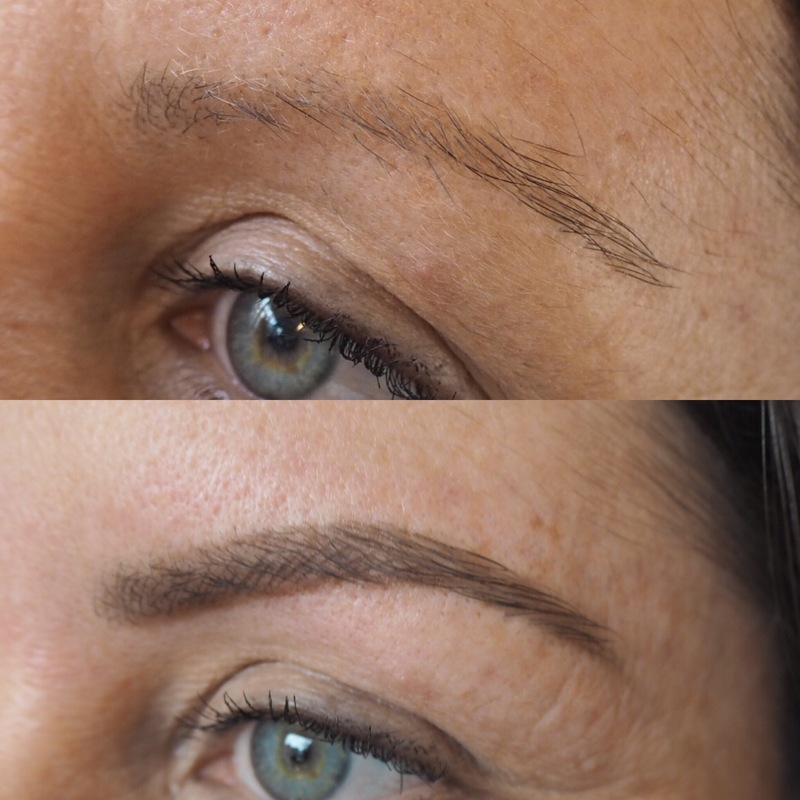 She’s on a regrowth programme, meaning that her eyebrows were decimated by years of plucking and she is seeing the HD Brow Stylist regularly (every 6 weeks) to keep them in shape while they regrow. My pal is banned from plucking and she applies HD Lash and Brow Booster daily to promote regrowth. HD Lash and Brow Booster contains active ingredients to promote hair regrowth and nourishes existing follicles to prolong hair life. It will probably take a couple of months to see its full effect. I’ll get back to you on that one. The whole treatment took about 40 minutes and was pretty painless. I found it relaxing. I couldn’t have been more chuffed with the results. Me and anonymous friend went out the same night with a gang of mum chums. Our brows were complimented to the max. During the course of the appointment I grilled the HD Stylist mercilessly on everything Brow related. Our conversation came to more permanent methods of altering brow appearance. If you have been trying to regrow your brows for yonks and there is still a bald spot that doesn’t look like it’s ever going to unbald. Or if you’re not blessed in the brow department to begin with, then Microblading could be the answer. You might have seen brow tattoos on people which don’t look so great- a bit blue or a bit slug like. 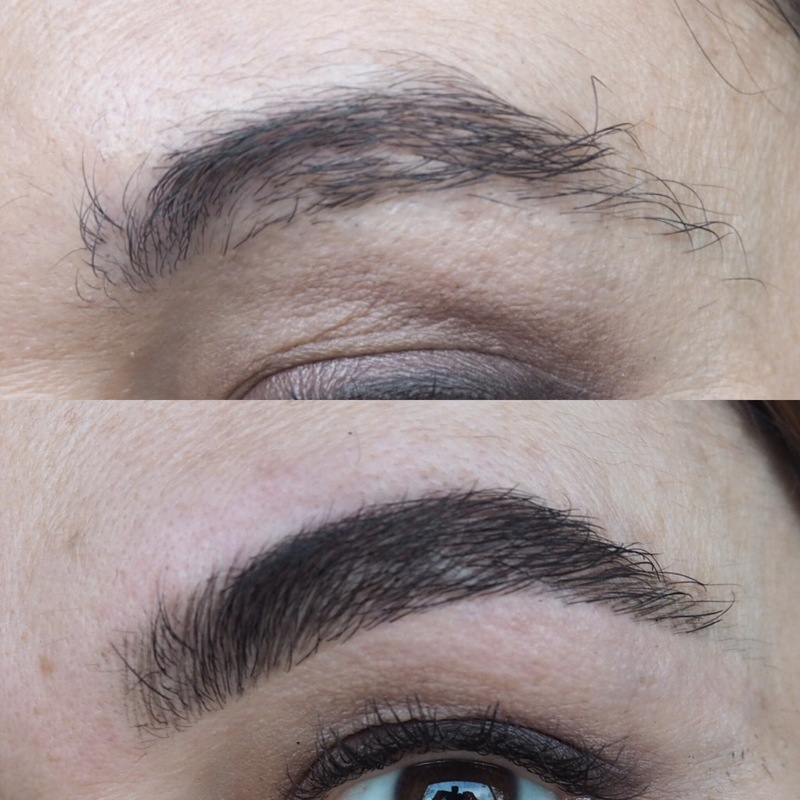 Microblading is different, the stylist uses a handheld tool to create hair like strokes. The microblader uses semi permanent ink that will fade after a year. It’s similar to tattooing but because there’s no machine, there’s no vibration and the strokes can be that much more precise. Karen Betts in London, she is apparently the queen of Microblading and worth the trip to London. Tracy Giles, also in London, also amazing. It’s worth doing your homework when it comes to any permanent or semi permanent makeup and Instagram is a good place to start. You need to see many before and after photos. I’m so grateful to Celyn for her work on my brows. I’m really happy with the results of the treatment and would recommend the HD Brow treatment to everyone and anyone. I’ve been going to Celyn at Salon Nia for years, she is the queen of brows in Cardiff and such a lovely person too. Your brows look fab!